we'll take you through the entire online process. eSignature Guarantee is the only medallion stamp provider that allows you to verify your identity online. To do so, we combine state-of-the-art technology with an advanced intelligence identification verification system, so you can prove who you are while being protected from fraud. 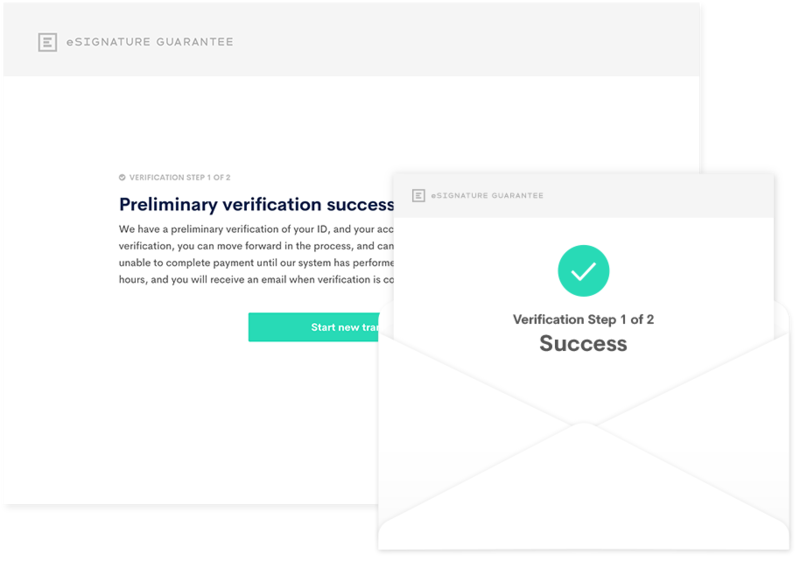 Once your account has been created, you’ll begin our advanced intelligence user verification process. 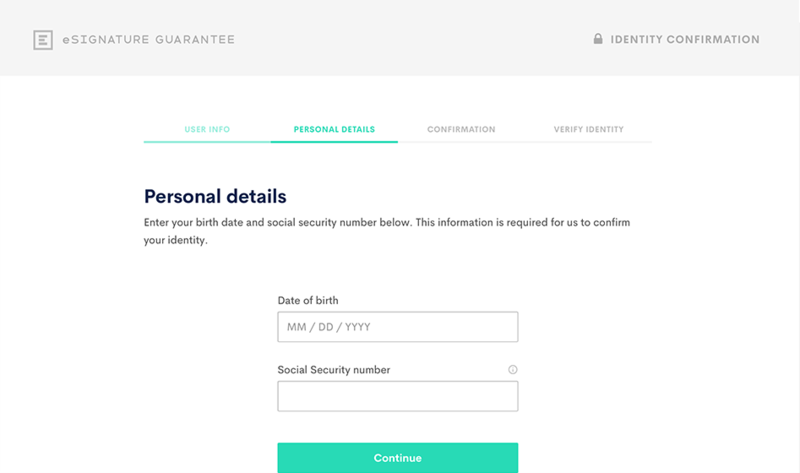 You’ll be asked for your name, address, mobile phone number, social security number and birthdate. This information is crucial, and without it we will be unable to verify your identity and continue with the process. 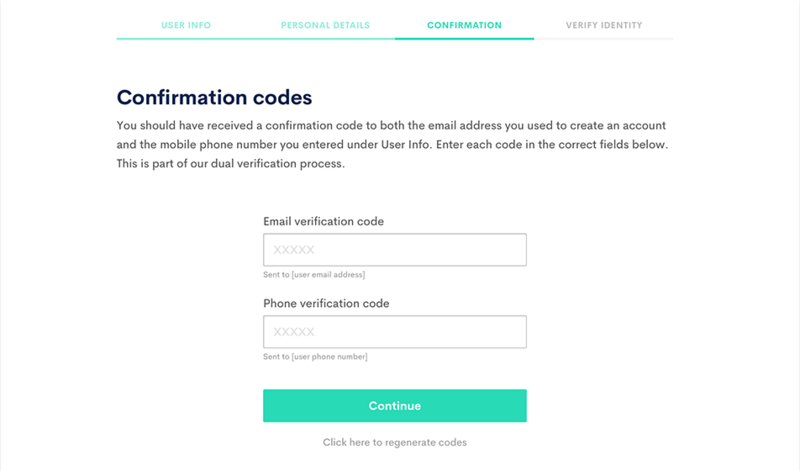 Next, you’ll receive confirmation codes to both your email address and your mobile phone. Each of these codes are different, and need to be entered into the correct field on the screen. 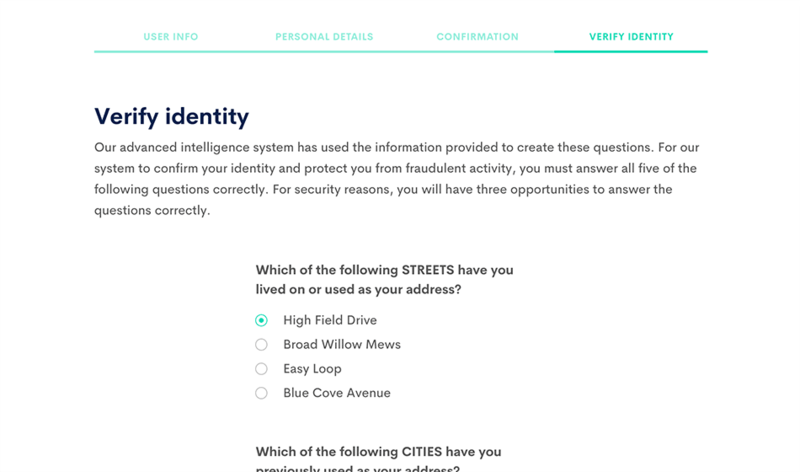 After you’ve confirmed both your mobile number and email address, our advanced intelligence engine will ask you a series of multiple choice questions that only you could know. 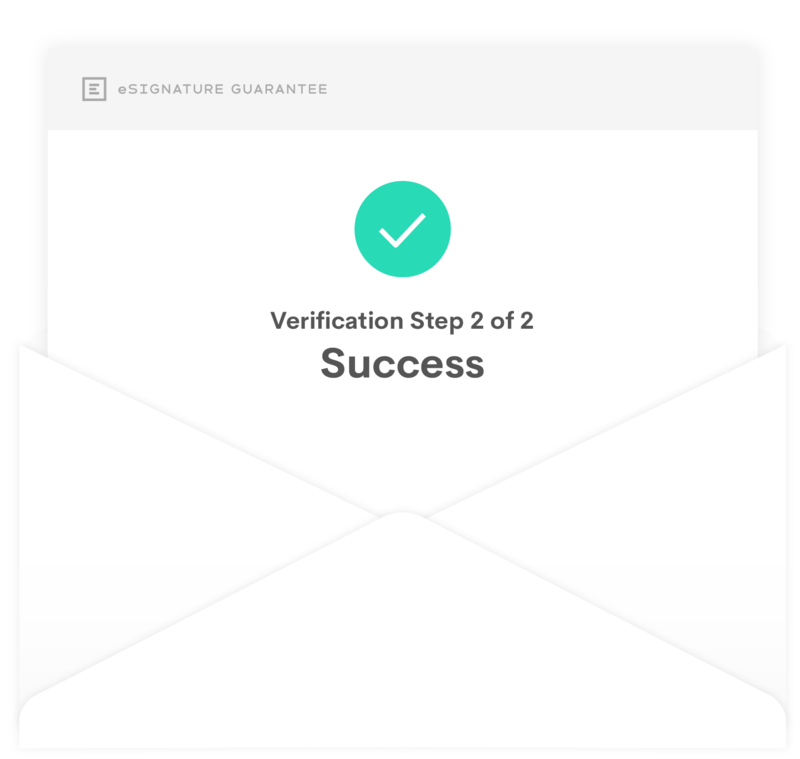 After answering these questions correctly, you’ve passed through our dual-verification process, and your identity is confirmed. Due to the amount of information required on screen, the securities details section does not support mobile phones. Please switch to a laptop/desktop or large-screen tablet to continue. 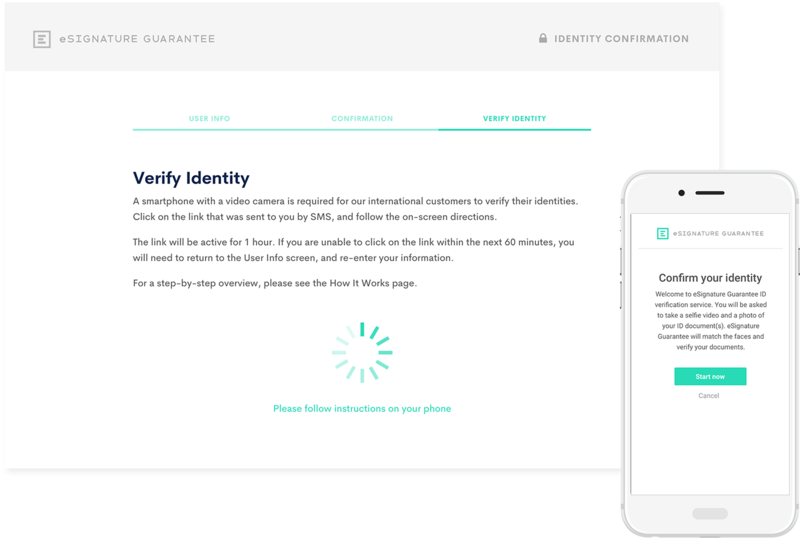 eSignature Guarantee is the only medallion stamp provider that allows non-US citizen to verify identity online, and receive a medallion signature guarantee stamp. 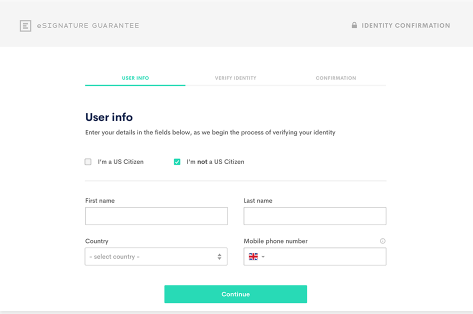 Once your account has been created, you’ll be asked for your user info. Check the box indicating that you are not a U.S. citizen, and enter your name, phone number, and country of residence. Once that information is entered, click continue and you will receive different confirmation codes to both your mobile device and email. Enter the confirmation codes you received into the correct fields. Each of these codes are different, and must be entered into the correct field on the screen. Once the codes are entered, click continue. After clicking continue, you will receive an SMS with a link on your mobile device. Click the link, and you'll be taken to a page where you will be asked to film a selfie video and take a picture of tour driver's license or passport. The link is valid for one hour, and only be used on mobile device. Using your mobile device, click on the link you received via SMS. You will be prompted to take a seven-second selfie video. Holding the phone top to bottom directly in from of you, look slowly to the left, and then look slowly to your right. The video should take about 7 seconds. Atter you're finished, watch the video to make sure the picture is not fuzzy. If you need to, you can take the video again. Once the video is clear, click next. 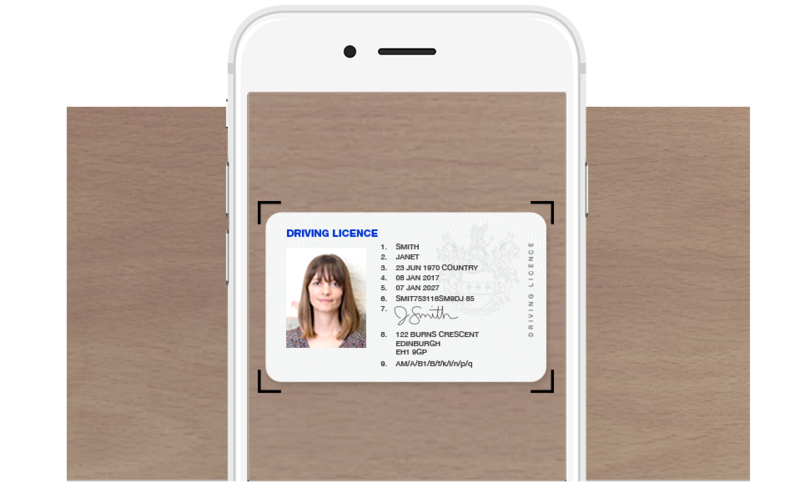 Take a clear picture of your passport or driver's license. The passport should be on top of a contrasting background color, and the picture should be taken as a portrait photo, meaning the camera is held top to bottom. If the picture is clear, click submit. 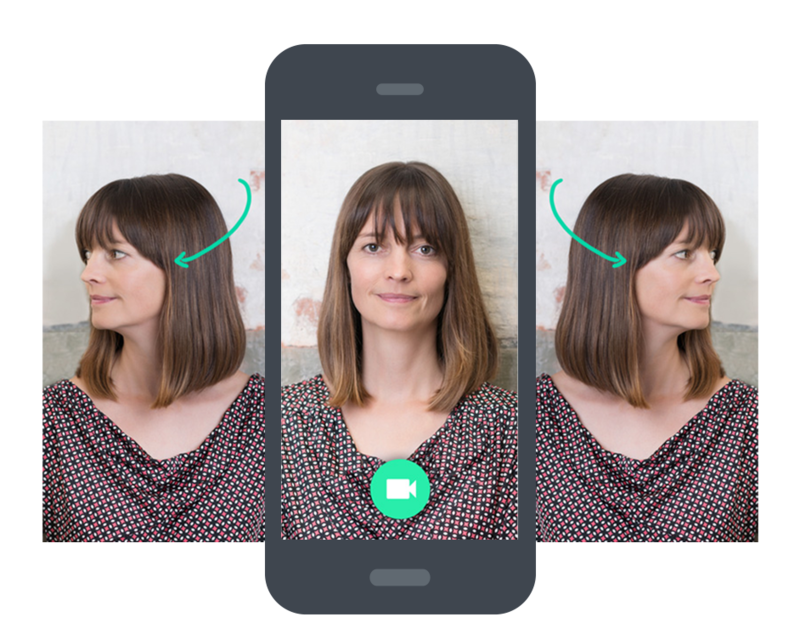 Next, our AI engine compares the selfie video to the image in the ID. The comparison is completed in a few minutes, and if they match, you may start a transaction. However you will have to wait for the final verifcation to complete the checkout. Return to your browser window or check your email to continue. Please note the securities details section does not support mobile phones. Please switch to a laptop/desktop or large-screen tablet to continue. You will receive a second email after the final verification is completed. This typically takes 4-6 hours, and can take as long as 24 hours. If your identity is confirmed, you will be able to complete the checkout, and receive your medallion signature guarantee. If your identity is not confirmed, you will receive instructions for how you can continue. 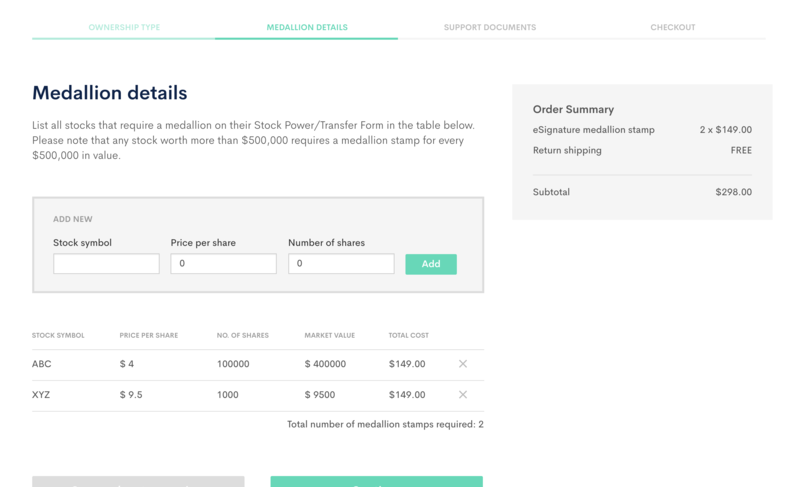 At this stage, you’ll tell us about the securities that require stamps, provide us with supporting documentation, choose a shipping method and pay for the service. On every screen you’ll find helpful information to make it easy to get through the process. After you’ve verified your identity, you’ll be asked for information about the securities that require medallion stamps. Begin by telling the ownership type, as well as the type of securities that you own. Next, you’ll be asked about the details of the specific securities that require stamps. Our medallion stamp is only valid on stocks up to $500,000. 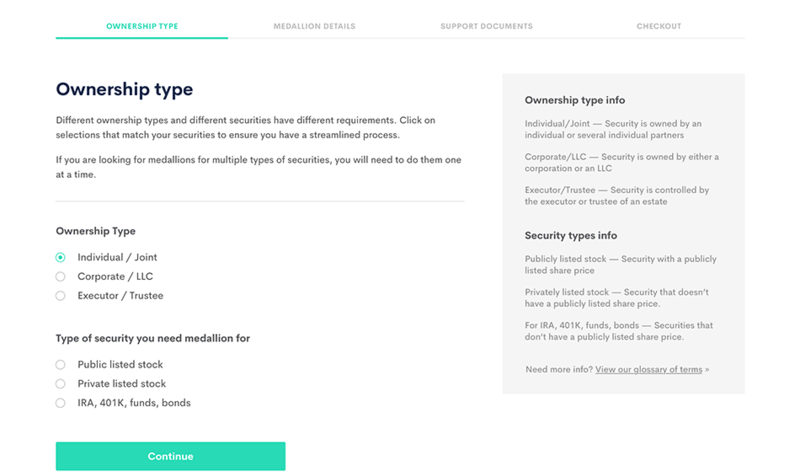 Once you’ve entered in the details about your securities, you’ll be asked for supporting documents, such as stock power agreements or statement of ownership. You have the option of uploading these documents, shipping them to our offices, or uploading some while shipping others. If you choose to upload the documents, you also have the ability to use our digital signature tools. 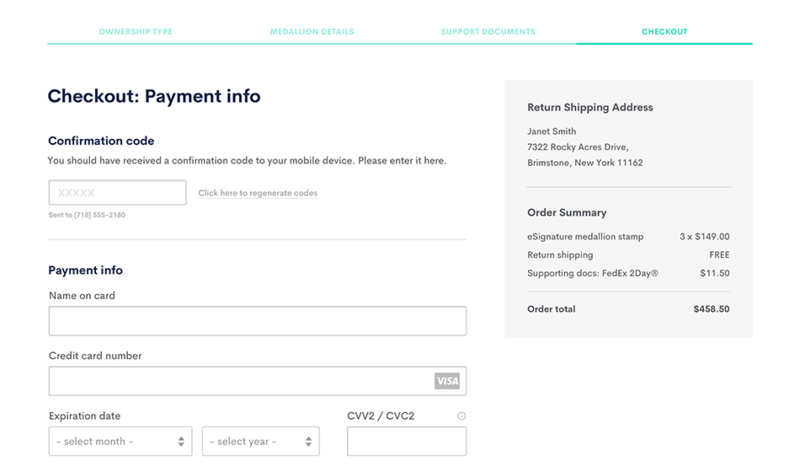 After you’ve finished entering your transaction information, you’ll be taken to our checkout page. If you have a different return address, you can enter it in here. 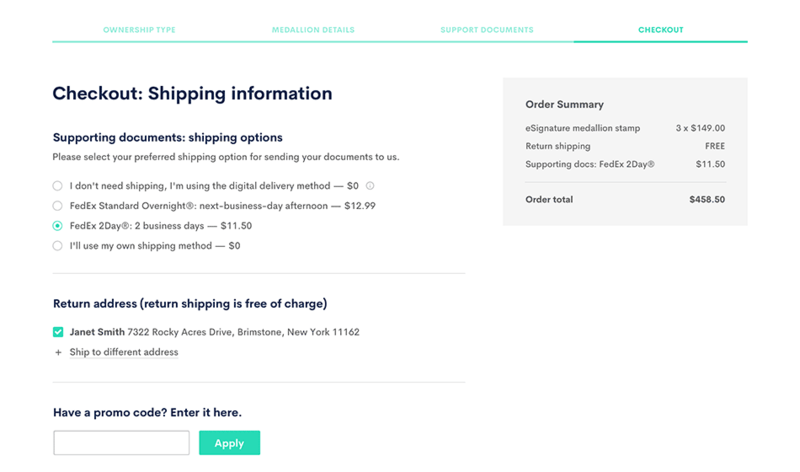 If you decided to courier your documents to us, you’ll be asked to choose your shipping method. 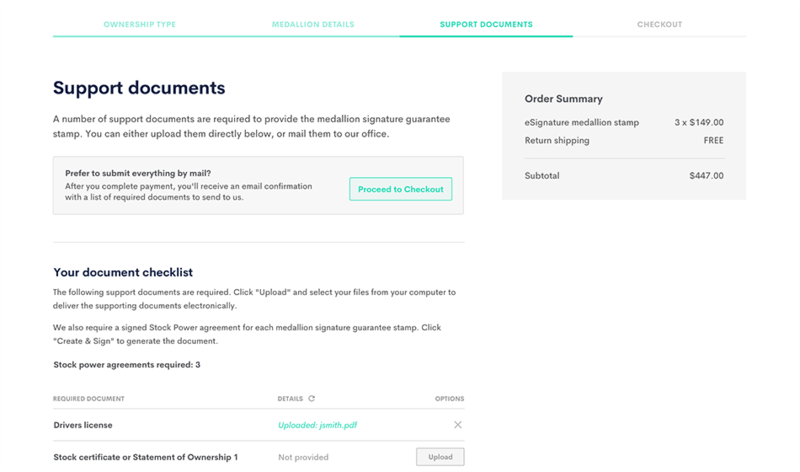 eSignature Guarantee pays for return shipping in most situations, but if you choose to send us your supporting documentation you are responsible for the shipping costs. We do, however, allow you to use our FedEx account, so you can easily print a shipping label through our system. Next, you will a receive confirmation code to your mobile phone. This will be the last step prior to entering your credit card payment info. 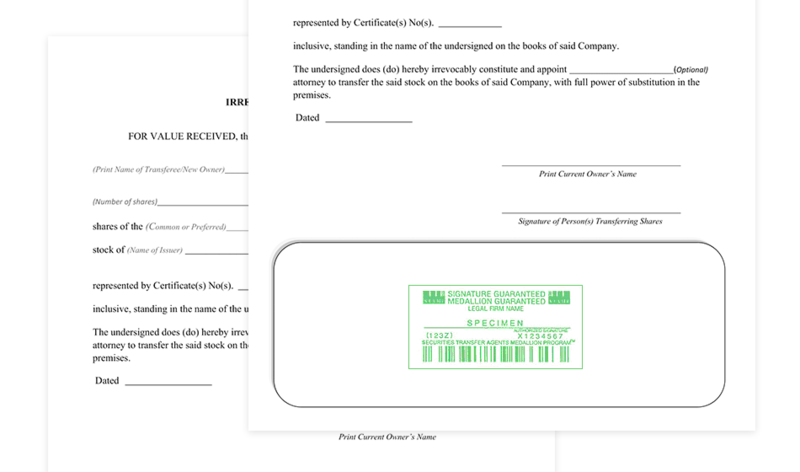 eSignature Guarantee will stamp and ship your securities certificates once we’ve received all the supporting information. Ready to get your medallion stamp? Additional Questions? Visit our FAQs page.